We’re huge fans of SMS marketing best practice and compliance. If you’re not doing SMS the right way, don’t bother doing it all. In fact, invasive, black hat tactics will actually damage your business. We could go on for hours about tons of poor practices we detest. But to save us all the grief, let’s just review the cardinal sin of SMS marketing. Unfortunately, this is a common mistake. And let’s acknowledge, most of our awesome users don’t even realize they’re making this terrible error. So, enough with the anticipation. 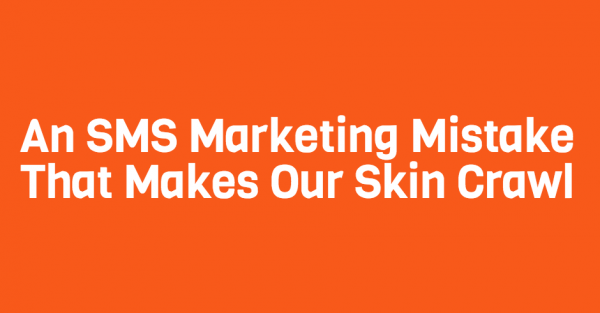 What’s the one cardinal sin of SMS marketing that makes our skin crawl? Using SMS marketing solely as a communication tool. Sure, as discussed in the previous blog post, we have people who use our service for text communication. Depending on your goals, this could very well be an effective solution. But, if you’re a small business owner looking to maximize your bottom line, this isn’t the best direction. Let’s say you own a local bar and grill restaurant. On your promotional materials, you tout an SMS rewards program. With the terminology, “rewards”, people assume they’ll receive exclusive and high value offers. But, a few weeks after initial opt in, you’re only firing out generic announcements. You inform potential customers about schedule changes, holiday closings, and new menu items. Although this is definitely informative, it’s not what your subscribers signed up for. Now, just so we’re clear, announcements are acceptable. But, with SMS marketing, each announcement should also be coupled with an offer. Stick to this general rule, and you’ll observe lower opt out rates and increased offer redemption. Partner up with top SMS marketing provider, Slicktext.com. Give us a call at 1.800.688.6290 to learn more, or hop over to the pricing page and sign up for your free plan. Our feature rich platform empowers small business owners to succeed.